Join the discussion on our forums! 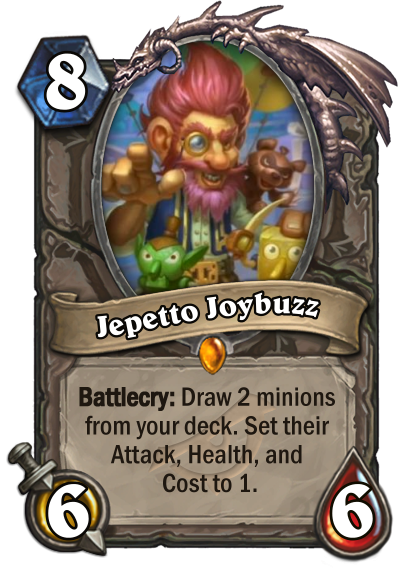 Come discuss Jepetto Joybuzz over in our dedicated Jepetto Joybuzz discussion topic. Battlecry: Draw 2 minions from your deck. Set their Attack, Health, and Cost to 1.
should i craft this or too early? Just wait a bit more, there doesn't seem to be any really good combos yet. If anyone knows how to warp a deck, its definitely Valeera. And with Myras Unstable element here, it makes me seriously consider MalyRogue's return. Only thing that'll hold it back is how long it may take to play this. Deck may be too slow, but we never know. “Cost 1-mana” → Rogue card. Could be good with Pogo-Hopper as it does not care about stats and 1-mana discount is always good. Sure, except that mage is not that minion dependent. Imagine if Pocket galaxy read "Your spells cost 1". OTK 1 cost Malygos combos incoming.